I know I mostly do baking here at Cakeisnotalie, but as I graduate from college and begin packing to move out of my house, I realize I’m beginning to cook “actual food” (gasp) instead of just sweets and desserts. Besides, you have to serve something as the main course for your gaming dinner party, right? Modded Skyrim Beef Stew. Check it out! 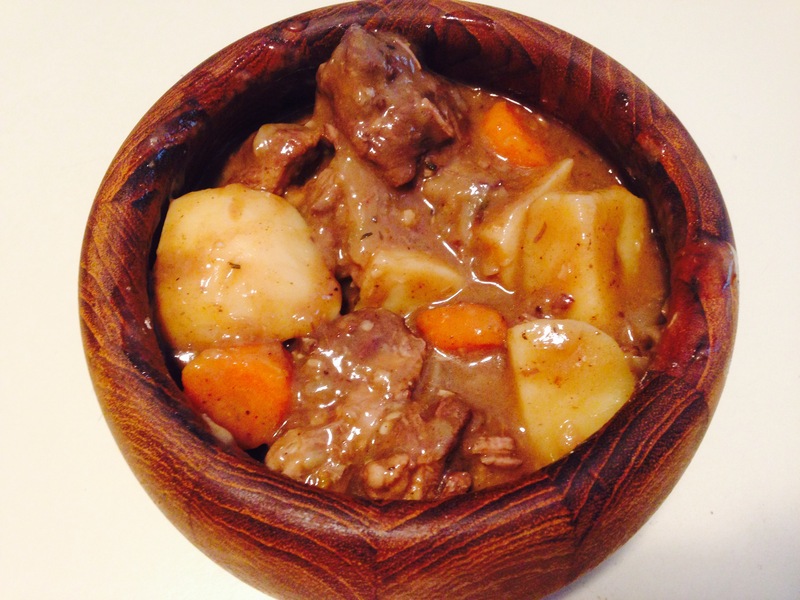 My Real-Life Skyrim Beef Stew! This Skyrim Beef Stew recipe takes a bit of time to make, but it’s what I like to a call a “one pot slop recipe,” meaning you make the whole thing in one pot and leftovers are easily reheated to eat later. Perfect for college style eating habits, or single living. I never bothered to cook in Skyrim because it seemed boring, and there were just so many better things to do (See: How to Play Skyrim Like a Girl). Whenever I dabbled in cooking, I just thought ”This is boring, tedious, and the food is just useless.” Well, guess what: I was wrong. Beef Stew (along with horker stew, venison stew, and vegetable soup) is an extremely overpowered food. First: It takes 1 point of stamina for a power attack or shield bash. 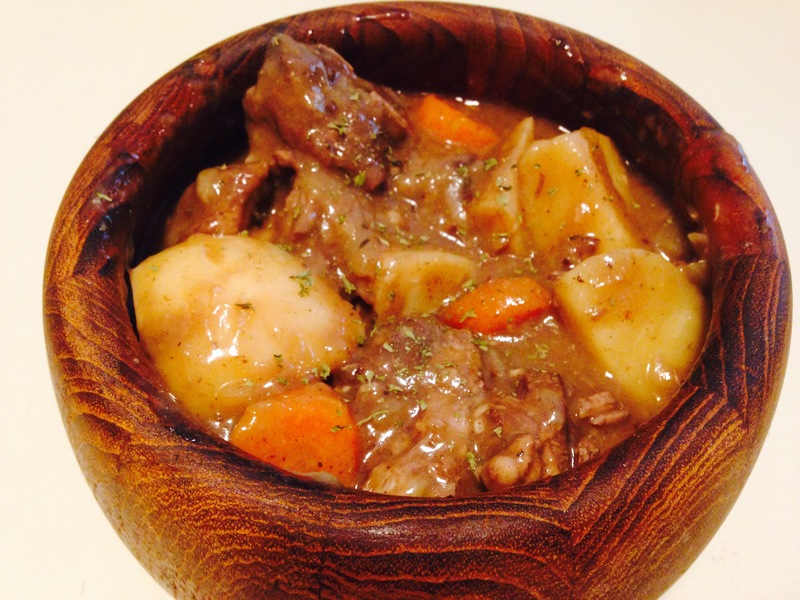 Beef Stew restores 2 Stamina per second for 720 seconds. That’s right, 2 stamina per second for twelve minutes! This means when you stammer an enemy with a power attack, by the time the enemy recovers you should have enough stamina to do another power attack right away. This does requite some skill to pull-off, but if you are a one-handed warrior who uses a shield you can bash, hit, bash, hit over and over and you will pretty much never get hit. Basically, eating stew gives you infinite stamina for twelve minutes. If you are a true stew enthusiast and make enough to eat it all the time, you basically never have to put points into stamina when you level up (allowing you to put all your points into health or magic). Skyrim Beef Stew, without any mods. You’re gonna want to preheat your oven to 325°F, with a rack in the middle (You’re putting a huge pot in there). Do this once you finish cooking your beef. Season your beef with salt and pepper. Just cover them in it and rub it in. In a large pot, heat about 1 tablespoon of olive oil over medium-high heat until hot. 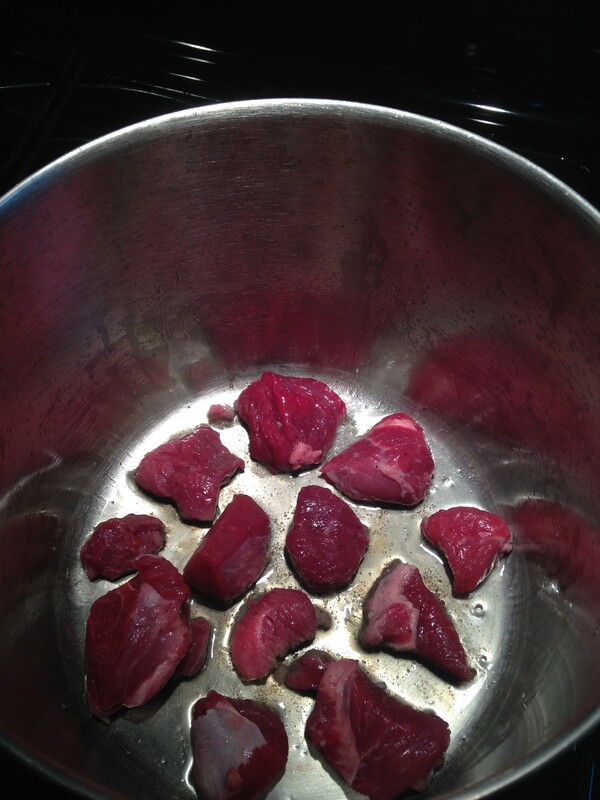 Sear the meat in batches, adding one tablespoon more oil for each batch. Searing meat means to let the meat develop a brown crust before turning them, preferably with tongs. You want to turn the mean the fewest amount of times possible. Also, when you sear meat you should not crowd the pan – if the meat is piled on each other, it won’t get that brown crust. 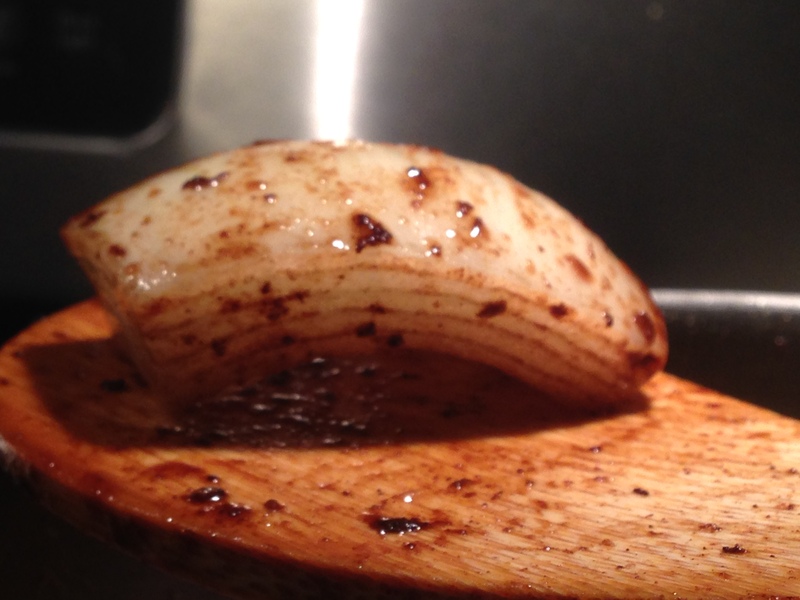 While the meat is searing, cut up your onions and garlic. 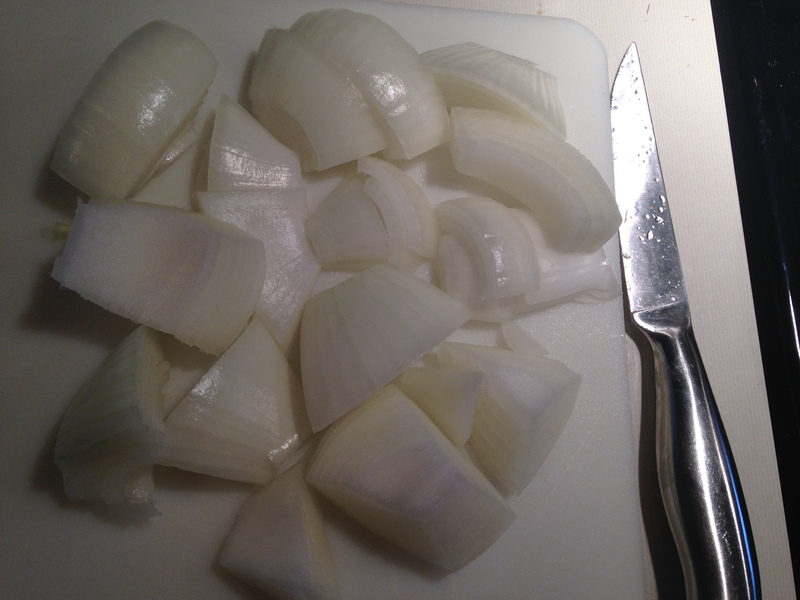 I like to “peel apart” my onions after I cut them, so they aren’t all stuck together. When done, transfer meat to a large plate and set aside. Cut up any pieces that look like they are too big. It’s okay if the meat is still a bit pink inside. 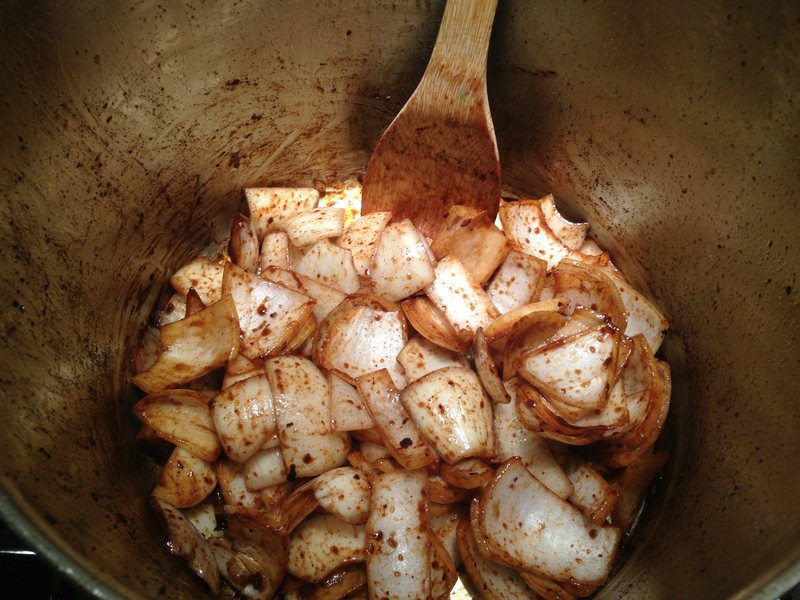 Without wiping the pot clean, add your onions, garlic, and balsamic vinegar. 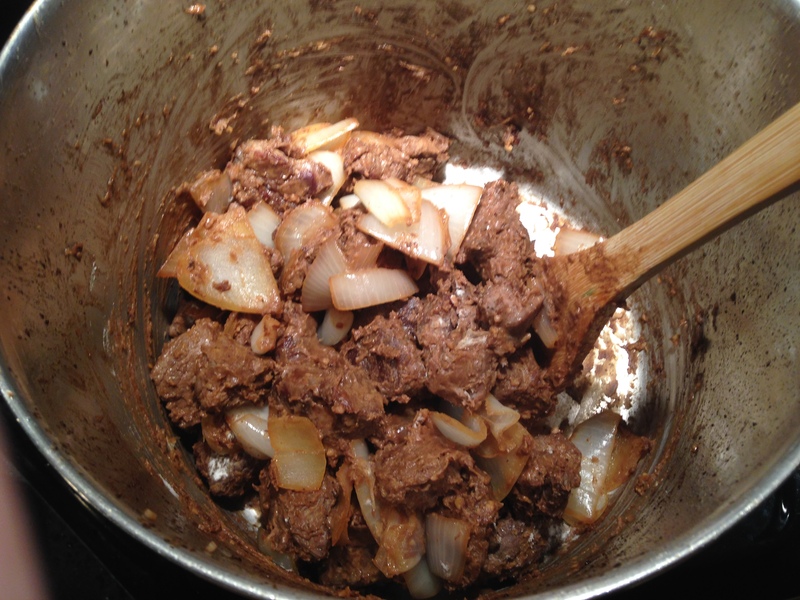 Cook, stirring with a wooden spoon to scrape brown bits from bottom of pan, until the onions are all coated. This is why I like to peel my onions apart. The middle of these onions won’t get coated. 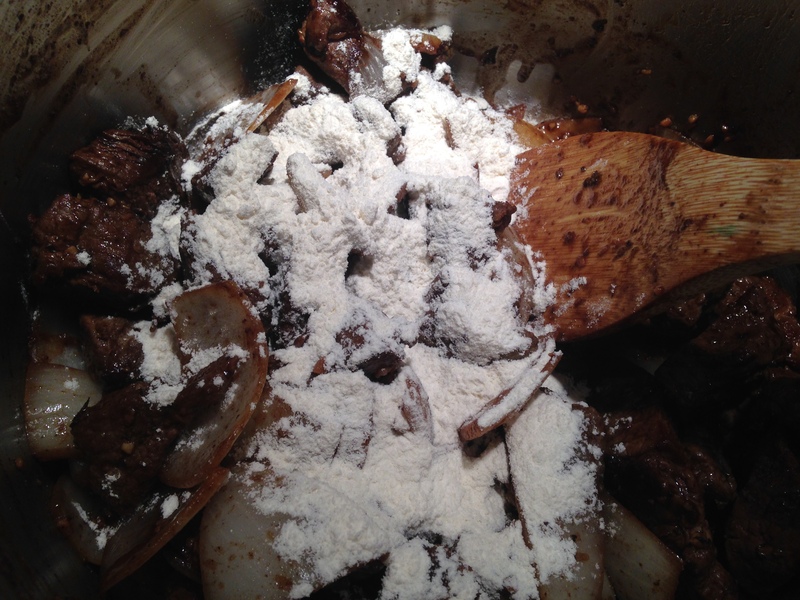 Next add your beef back to the pot and add your 1/2 cup flour. Stir it around with your wooden spoon until the flour is dissolved. This way your sauce will be thickened without becoming lumpy. Your meat might start to look a little sticky, but that’s okay. Add the 2 cups of wine. 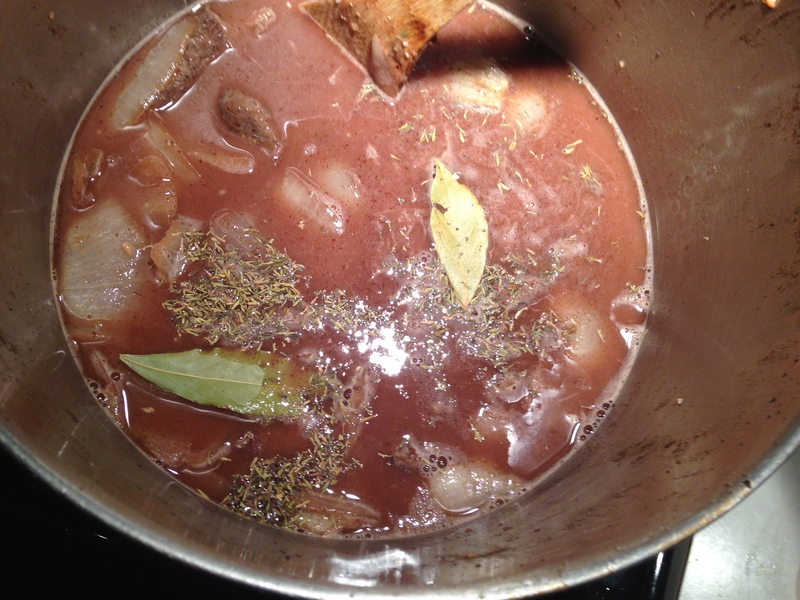 4 cups beef broth, bay leaf, thyme, salt, and pepper. Stir, scraping the bottom to loosen any brown bits, and bring to a boil. Cover your pot with a lid and put it in the oven to cook for 2 hours at 325. While it’s cooking, chop your potatoes and carrots. 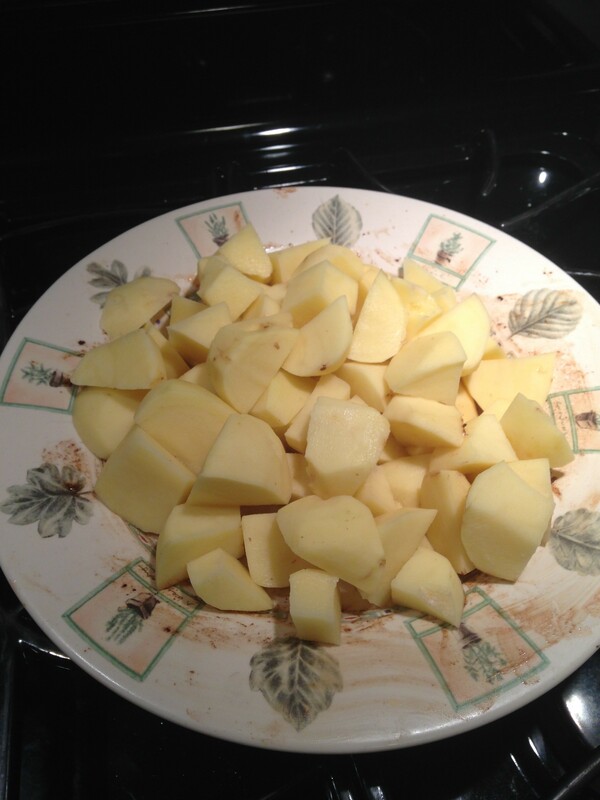 I use 4 – 5, handful sized yukon potatoes. Chop them up into bite sized pieces. 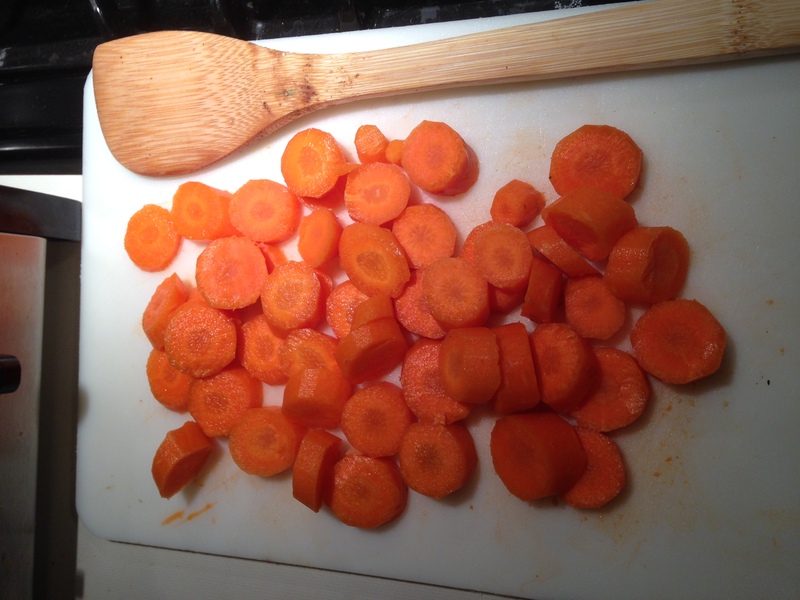 Do the same thing with your carrots. 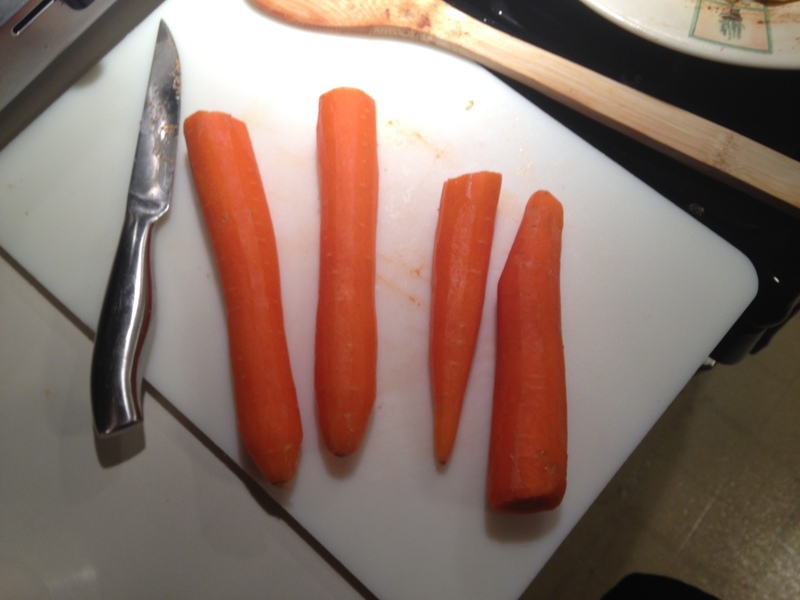 I use 4 – 5 big carrots. 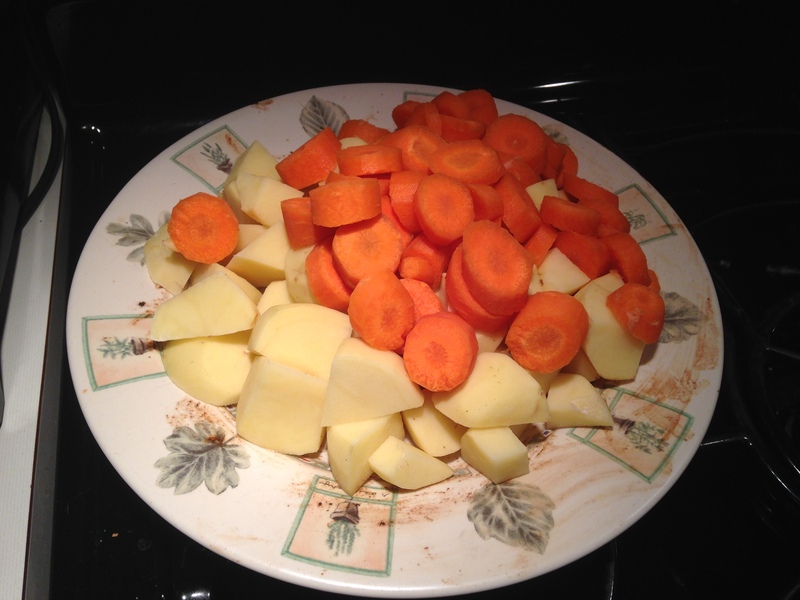 After 2 hours, remove the pot from your oven and add the carrots and potatoes. Cover and place back into the oven for 1 more hour. After that, you can taste you stew and add any more salt or pepper. Don’t worry if your sauce looks thin, it will thicken up by tomorrow. 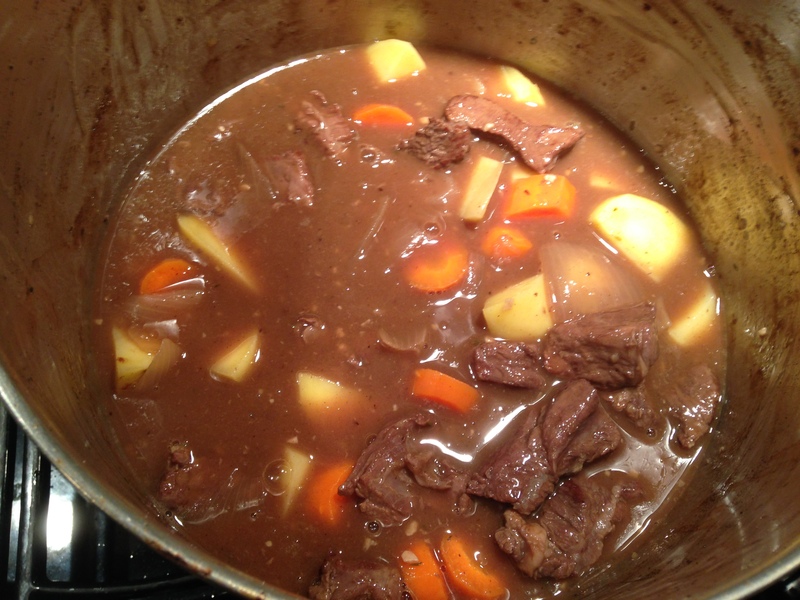 In fact, this stew improves in flavor if made at least one day ahead. You can then easily reheat single servings in the microwave, or the whole pot in the oven again. 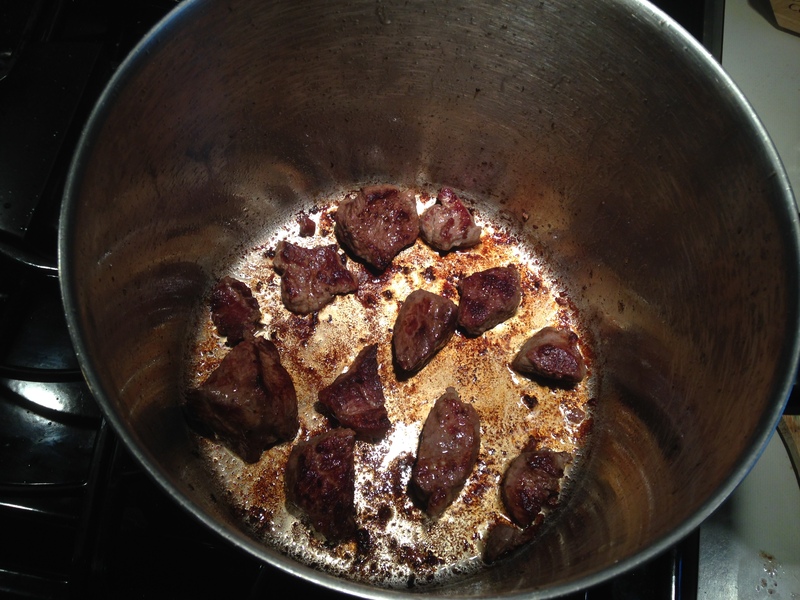 And there you go – Skyrim Beef Stew!